Marcus Wicker, author of the award-winning book of poems, Maybe the Saddest Thing, taught an interactive master class on poetry — exclusively for Point Park students — Dec. 4 as part of the University's Writers' Series. In the master class, Wicker challenged students to write unconventional, contemporary forms of poetry including free verse and invective poems. Wicker also discussed the use of anaphora, or repetition, in poems and advised to students: "A good poem always has tension." "Marcus was very relaxed and entertaining. I learned a lot about the two types of unconventional forms of poetry he talked about," said Derek Johndrow, a senior English/Creative major. Student Sarah Molka was excited to meet Wicker in person since she recently gave a class presentation on his work. "I enjoy his style of writing and the strong messages he evokes," said Molka, who is also a senior pursuing a Bachelor of Arts degree in English/Creative writing. "The Writers' Series is beneficial because it gives students the opportunity to talk with successful writers about their own experiences in getting published," explained Kaylee Ritchie, a junior English/Creative writing major. Sarah Perrier, Ph.D., associate professor of English and coordinator of the Writers' Series, was impressed with how Wicker invited students to find their own ways to interact with poetry. "I love how poetry can bring groups of people together, and I think Wicker's visit to campus really helped more people feel welcome to join our group of creative writers at Point Park - regardless of their major or experience with writing," said Perrier. 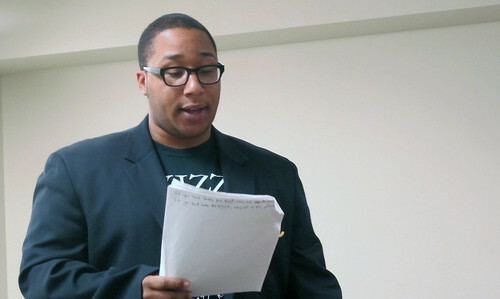 The previous day, Wicker led a poetry reading on campus open to the public. "The Writers' Series has been something I look forward to every semester. Not only do I get encouragement and inspiration in meeting successful writers and taking their advice, but artistically I find writing a piece on the spot and sharing it to be incredibly reassuring, validating and constructive," remarked Natasha Neira, a senior majoring in English/Creative writing. The Point Park Writers' Series presents public readings and master classes throughout the academic year. Previous featured speakers have included poets Karyna McGlynn, Eduardo Corral, Sandra Beasley and Mary Biddinger and writers Ivan Rodden, Brigid Pasulka and David McGlynn.